Welcome to our website. Perhaps you were referred by a friend, neighbor or family member … or maybe you found this site by “accident” (if there is such a thing). Regardless of how you got here, OUR GOAL with this website is to help you. As you go through our site you will find valuable information about us and about the cleaning industry in general. 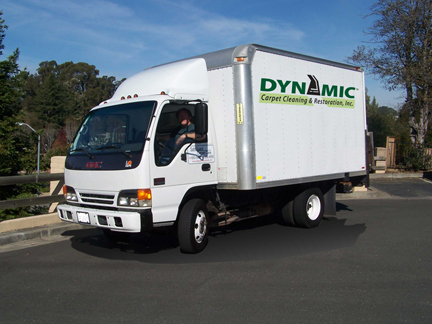 First off, at Dynamic Carpet Cleaning & Restoration we specialize in high quality restorative steam cleaning without the use of harsh chemicals or without leaving sticky soap residues behind in your carpet or upholstery. This may not be of concern to some, but it is for us. Many cleaners in the Bay Area are guilty of just that — using detergents that contain harsh solvents. Among other things, these detergents can be irritating to the touch and to breathe. Don’t think for a minute the soap is gone after carpets have dried. It isn’t! Think about the vigorous rinse cycle your laundry goes through to get the soap out. Steam cleaning is typically done with one or two passes over the carpet and depending on the equipment used, it’s generally nothing compared to the rinse cycle for your laundry. The end result is remaining soap residues. And among other things, that typically means the carpets and/or upholstery will literally be a magnet for dirt. It’s so common to hear from our new clients that they think they may need new carpets — that their carpets just keep getting dirtier faster and faster. It’s not their carpets. It’s their carpet cleaner. So how do we do it? At Dynamic Carpet Cleaning and Restoration, we use a very effective soap-free product. To begin with, there are no harsh chemicals or soap residues to leave behind. Used in conjunction with a unique and very thorough multiple step restorative cleaning process, very powerful truck-mounted steam cleaning equipment and over twenty years experience, our service is simply unparalleled to the others. We are very confident our services exceeds similar services in the area of thoroughness and quality and the improved longevity for which the cleaned items will last. We succeed in removing tough dirt and stains where others fail! Not only do we successfully clean tough dirt, grease and grime, we also remove many allergens that can give you headaches, stuffy noses, colds and other annoying discomforts. Cooking oils, smoke residues, ground-in food crumbs, cigarette smoke, dead skin (food for dust mites), “accidents” from pets, tar, and trace radioactive metals and other contaminates steadily accumulate in your home everyday. We are so certain you will be absolutely thrilled with our service we have backed it with a 200% Money Back Guarantee. How this works is if for any reason you are not happy with the work we performed we will come out and re-clean it again for free. If you still are not satisfied we will hire another company of your choice and at our expense to clean it again for you. We are located in San Jose, California and service much of the Bay Area. We service areas from San Jose and up the Peninsula over to surrounding areas on the East Bay. We are licensed and fully insured.